1.In large saucepot, heat 1 tablespoon oil over medium-high heat; add chicken and cook 3 minutes or until browned, stirring frequently. Remove chicken; reduce heat to medium. Add remaining 1 tablespoon oil and onions; cook 10 minutes or until soft, stirring occasionally. Add water, sugar, cinnamon, ginger and turmeric; heat to a simmer. Add carrots and potato; cover and cook 20 minutes. 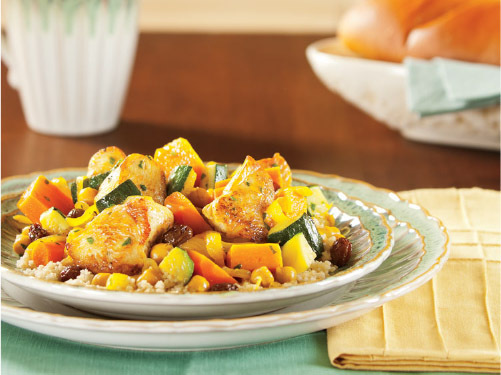 2.Add garbanzo beans, zucchini, raisins, lemon juice and chicken; cover and cook 10 minutes or until chicken is no longer pink and vegetables are tender. 3.Prepare couscous as label directs. 4.Stir in oregano, salt and pepper. Serve stew over couscous. Show your heart some love with the anti-infl ammatory properties of cinnamon, ginger and turmeric.